I know I say this in every monthly favorites post but holy moly this year is FLYING. I can't believe I can finally quit saying "PSLs will be here before we know it" because THEY'RE HERE, friends, they're here. Yes, I'm planning on getting one today. If you're basic and you know it, clap your hands [clap clap]. 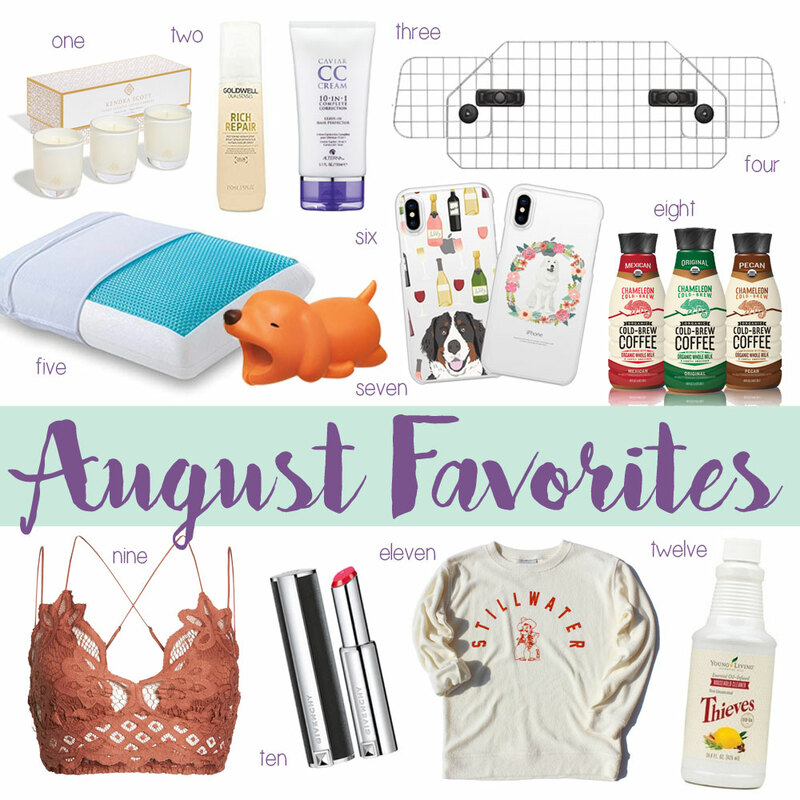 I haven't tried tooooo many new products or gadgets this month because all my moneys have gone to clothes to take to New York Fashion Week next week. HOWEVER, the couple of new things I have gotten are serious winners! These candles smell amaaaazing. If you're local and want to smell them for yourself, come to Kendra Scott in Classen Curve tonight from 5 - 7! I'll be hosting the fall candle launch with my blogger bestie, Ashley from Sass and Satin. There will be a store wide discount, sips, sweets and more! I recently got my hair cut and colored and the stylist next to me sprayed this on her client. It smelled SO good that I had to ask what it was! My stylist then used it on me and I was hooked. It smells like orange creme deliciousness and makes your hair super soft. I use it before blow drying! I shared last month that I ordered the Alterna Caviar Anti-Aging Shampoo and Conditioner from the N-Sale. It came with a sample size leave-in product and I just now got around to trying it. The verdict? LOVE. It is a great heat protectant and healing cream so my hair feels healthier than ever. It also doesn't weight my hair down like some products can. After styling, it feels soft and looks so shiny! I got a new car recently and was bound and determined to NOT let my dogs ruin it by getting dirt and hair everywhere. We took a little family road trip to my parent's house in Arkansas a few weeks back (so the dogs came with) and I knew I would have to take the proper precautions. I ordered this SUV dog gate and a back cargo liner from Amazon and am praising the good Lord above that they worked so well. I had a ton of people DM me about the gate, so here it is! It was a little hard to hang it up, but once it was up it stayed in place like a charm and kept Chloe from making her way to the center console. The cargo liner worked well too....some hair still got around it, but it definitely helped and made it less dirty than it would have been without it. I got this pillow a week ago and have been sleeping like a freaking baby on it. Literally.... I wake up with drool all over my face because I'm in such a deep sleep. It is a gel memory pillow and is meant to work for side sleepers, back sleepers and tummy sleepers which is great because I switch around! One side is a cooling gel and the other is regular but I LOVE the cool feeling. It is also anti-microbial which is always a plus. I have been waking up with headaches a lot recently and I think it was because of my old pillow because I haven't had that issue since I got this one! I got a new iPhone X a few weeks back so I needed to upgrade my case, too! Casetify has always been a favorite of mine because they have SO MANY case design options (and the BEST dog cases). Seriously, a case for every mood and season. I had about eight Casetify cases for my old iPhone that I rotated through every year. For my new phone, I got a Bernese Mountain Dog and Wine case and a Great Pyrenees Flower Crown case. I'm in love! They offer a ton of other breeds in the same case style, as well. To go with my new phone.......I got a cable bite! I think these things are the cutest, funnest cell phone accessory. They are meant to keep your cord from fraying on the end. Of course I got a puppy, but they have chameleons, sharks, pandas, Nemo fish, etc. It's no secret that I'm a coffee fanatic. Like, major coffee snob, can't go a day without it, drink it in the morning and the afternoon, drink it black, drink it creamy, drink it hot and cold...I LOVE coffee. I like to drink iced coffees and cold brews in the afternoon, and Chameleon makes it so easy! Their new cold brew is pre-mixed (instead of a concentrate that you have to mix yourself) and is so good! There are several flavors, but Pecan is my fav. Just pour and go! It's great to add protein or other dietary and supplement powders to. I fell in love with the Free People version that everyone is wearing but I wasn't about to spend $38 on it. I seriously searched high and low to find it on sale somewhere but came up short handed....until I found this dupe from Vici Dolls (pronounced Ve-Chee dolls....if you saw my insta-story you are probably LOL'ing at me). It is identical to Free People but waaaaay less expensive and if you sign up for Vici emails, you get a 20% discount code! It is crazy comfy and so flattering....I love it so much I want to order it in every color. I got this as a sample in a Sephora package and was instantly hooked! The texture is really good - not drying at all. It almost goes on a tad tacky but that keeps it from drying out (and it isn't toooo sticky to where your hair gets stuck in it). The color lasted a good half day (until I ate lunch) and wasn't too dramatic as it wore. You may have seen this sweatshirt on my insta-story, I got so many DMs about it, and let me just tell you it is every bit as good as it looks. SO COZY, so soft, so cute. I sized up one size for an oversized look (and to make it long enough to wear with leggings). 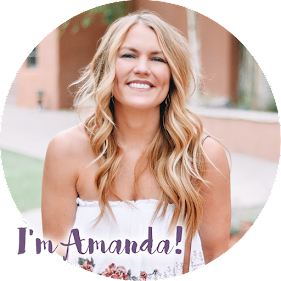 There are other schools available and you can get free shipping with code AMANDASOK. Who else is ready for OSU football tomorrow?!! Last but not least, I LOVE Thieve's cleaning spray! Like I said in my Friday Favorites post last week, I have loved getting into essential oils - and I never ever thought I would say that. I've been absolutely blow away at how well this cleaning solution works - and it smells like Christmas! I've cleaned so much more recently because 1) it smells great and 2) I keep testing it on new things to see if it works, and it does! If you are interested in trying it (or any other Young Living products), let me know and I'll hook you up. Also, side note, Thieves essential oil works really well on canker sores! There ya have it! Do you have any new things you're loving? If so, let me know! I am a product junkie and am always looking for an excuse to buy something ;) HA!